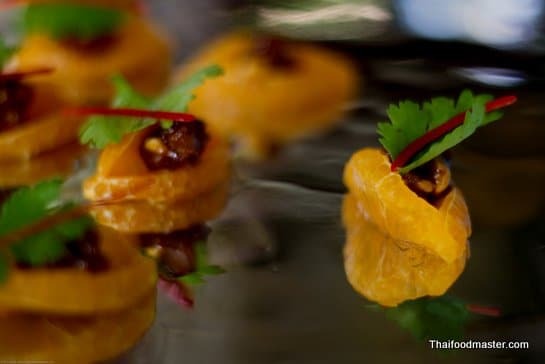 The salad’s complex flavors include intensely citrus-perfumed som saa peels, poached pork, soft gelatinous pork skin strips, and naturally sweet shrimp – bonded with a sweet and sour thick tamarind dressing, and bejeweled with a nutty peanut crunch, sweet crispy deep-fried shallots and golden garlic. 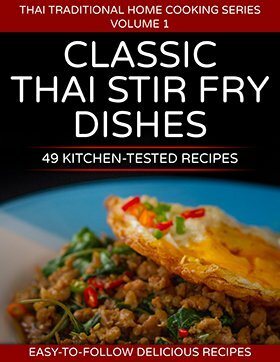 The dish is easy to prepare. 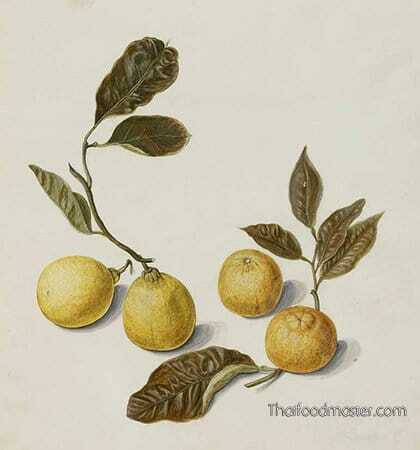 Featuring som saa (ส้มซ่า, bitter orange or marmalade orange; scientific name: citrus × aurantium), this citrus fruit of Indian origin is in season from the beginning of the rainy months until winter. 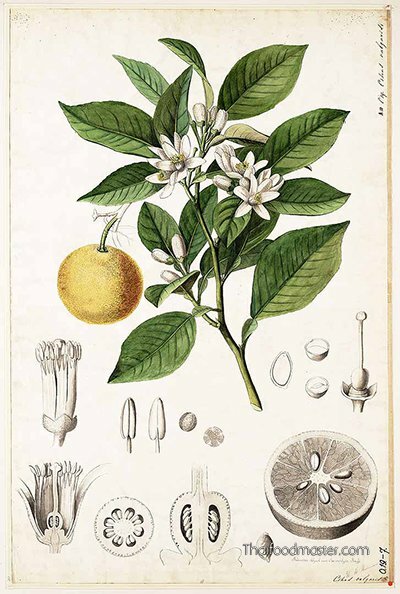 It is used as a flavoring agent or an herbal medicine that acts as a stimulant and an appetite enhancer. 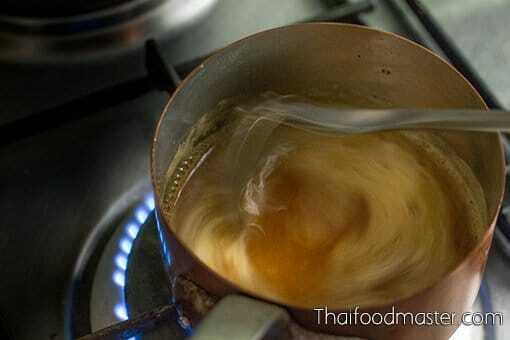 Som saa’s juice, its essential oils and its rich unripe green peel were common ingredients in both the savory dishes and desserts in the culinary repertoire of Siamese society’s elite in the early- to mid-1900’s. 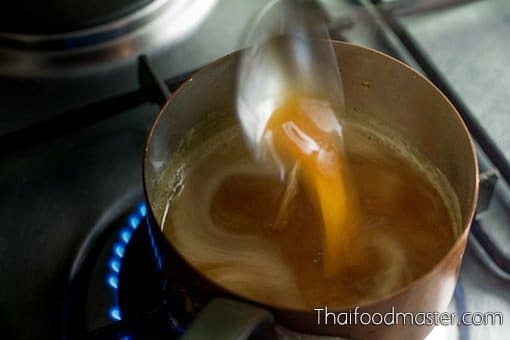 It is used in recipes such as yam phiu sohm saa (ยำผิวส้มซ่า), phat mee kraawp (ผัดหมี่กรอบ), massaman curry (แกงมัสมั่น), sai graawk bplaa naaem (ไส้กรอกปลาแนม) and gaaeng jee juaan (แกงจีจ๋วน), just to name a few…. 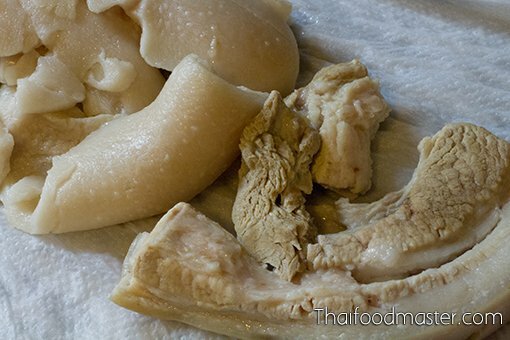 Layering flavors is an important characteristic of Thai cuisine, so it is not unusual to use more than one souring agent to achieve a pleasant harmony of several sour flavors; this generates an even more interesting experience as opposed to a monotone flavor with a fixed focal length. 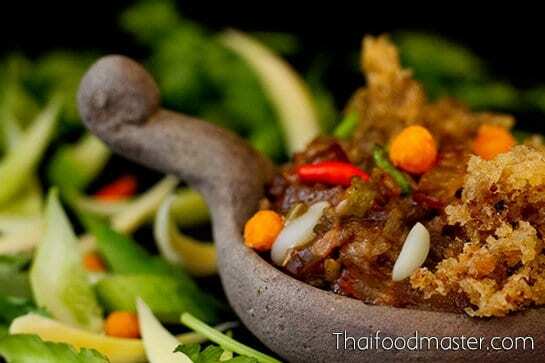 In addition to lime and tamarind, other fruits and young leaves are widely used for their tartness, namely green mango, kaffir lime, madan (มะดัน Garcinia schomburgkiana), dtaling bpling (ตะลิงปลิง Averrhoa bilimbi), som saa (ส้มซ่า) marian plum (มะปราง bouea macrophylla), asam gelugur (ส้มแขก), ragam (ระกำ salacca), kumquat (ส้มจี๊ด), hog plum (มะกอก Spondias mombin) som men (ส้มเหม็น green mandarin orange) and even tomatoes. 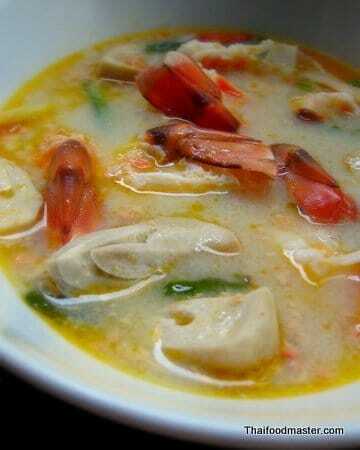 Nowadays, som saa is mainly grown in the Nonthaburi and Nakhon Pathom provinces. Both provinces are renowned for their fruit orchards. The fruit orchards were in that era referred to as the inner and outer gardens. The inner gardens (suaan nai สวนใน) covered the area west to the Chao Phraya River, in what is today Nonthaburi province. The outer gardens (suaan naawk สวนนอก) were further west, and spread from the Mae Klong River in Amphawa district of Samut Songkhram Province to Ratchaburi province. In 2011, Thailand suffered severe flooding that destroyed mature fruit trees across vast areas of Nonthaburi. The devastated farmers who had relied on the profitable durian trade for their livelihood – a tree that requires more than a decade to mature and bear fruit – turned to growing som saa as an alternative crop. 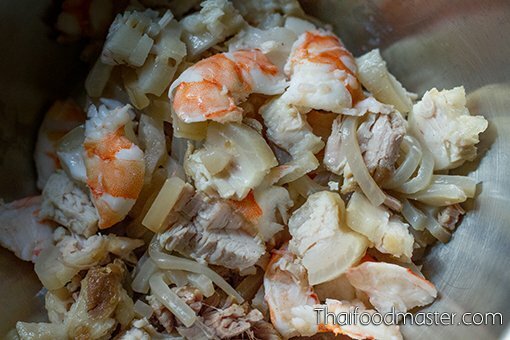 This, and the increasing popularity of traditional Thai food, have brought som saa back into the spotlight – and into upscale markets. Select unripe som saa with a deep green color. 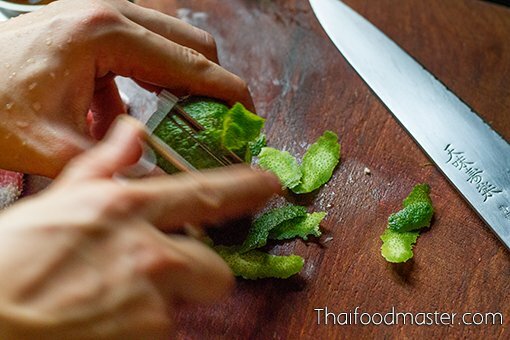 Poach the pork with pandan leaves and salt. This will improve its aroma. Do not overcook. 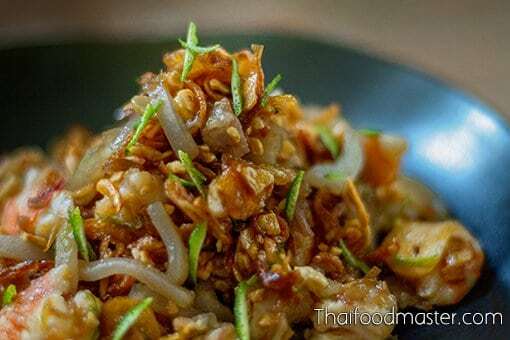 Always use freshly roasted peanuts, as well as homemade deep-fried shallots and garlic. 2 tablespoons roasted peanuts, crushed. 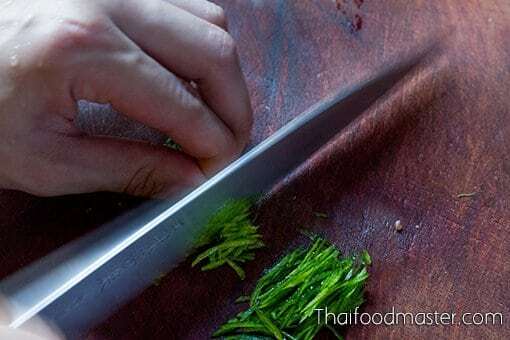 Poach the pork belly and skin with pandan leaves and salt without overcooking; cut into small pieces. 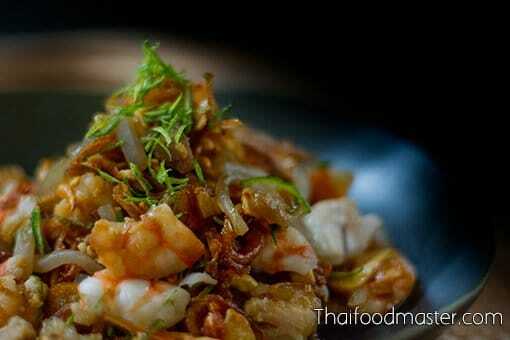 Boil the shrimp; cut into small pieces and place in a mixing bowl together with the pork belly and pork skin. 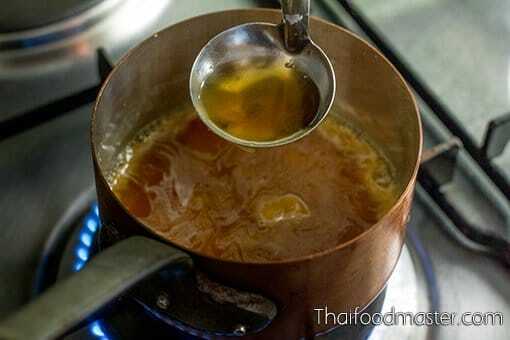 Over low heat, simmer palm sugar with two tablespoons of water. Select deep green unripe som saa fruits. Wash thoroughly and peel. 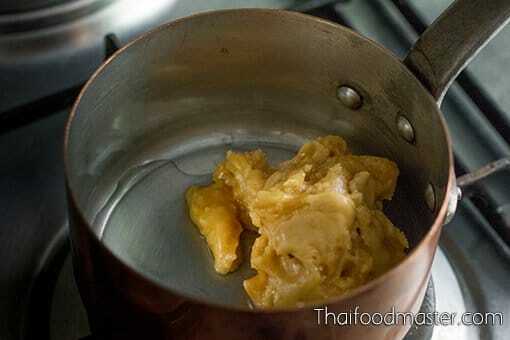 Finely slice the som saa peel and set aside. 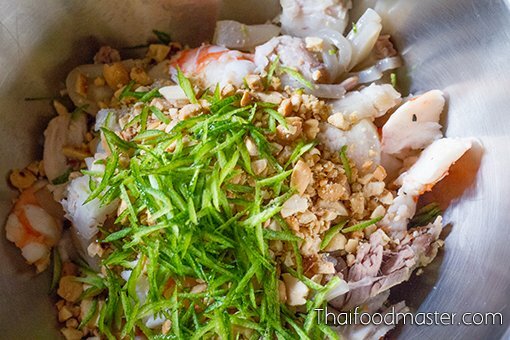 In a mixing bowl, add crushed ground peanuts and som saa peel to the pork and shrimp. 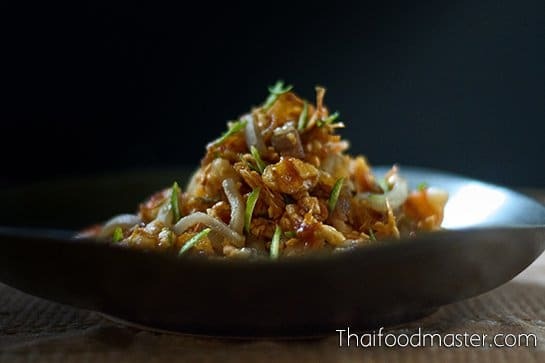 Add crispy deep-fried shallots, crispy garlic, and the dressings.